Copper Creek Homes is an approved Builder with several Lenders in Clark County and Portland Metro, if our Trusted lender is not the lender you are currently working with contact us and we will connect with your lender and work with them to become an approved builder. 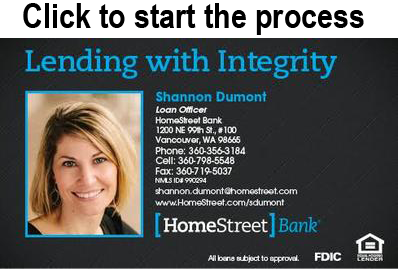 An example of a trusted lender we have worked with for construction financing is HomeStreet Bank. I work as part of an outstanding mortgage team, ready to work hard to make your dreams of homeownership come true. WE have over 15 years of financial and mortgage experience and can help you find the right financing for your one-of-a-kind mortgage needs with all of the programs HomeStreet Bank has available to you. I strive to make each deal pleasant and personable, whether you are refinancing, purchasing or building from the ground up. I have called Vancouver home my entire life and know your neighborhood well. Customer service, honesty and integrity are the cornerstone of my business. I take a consultative approach to the home loan process by customizing each home financing program to help customers achieve both their short term and long term financial goals. My mission is to get you the right loan that fits your circumstances, and to provide a level of service that makes process as seamless as possible. With my extensive knowledge and network of resources in this ever changing industry and market you will be happy that you have chosen me to be a part of your team.